Weddings at Kentchurch Court01981 240228work Wedding Ceremony VenueIn the heart of beautiful Herefordshire Kentchurch Court, this quintessentially English country house, provides the perfect setting for your wedding day. For the past fifteen years, we have been hosting wedding receptions here at Kentchurch Court. Word of mouth has been our only form of advertising. We are now licenced to hold civil ceremonies. • A bedroom for the bride’s preparations. • St.Mary’s church is within easy walking distance. 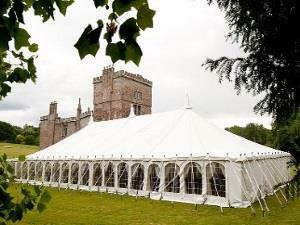 • Large grounds for marquee, and photos. • Great team of caterers. Kentchurch Court dates back to the 11thC and is surrounded by 20 acres of garden planted to delight throughout the summer and autumn. Kentchurch Court has been in the Scudamore family for almost 1,000 years. and both the Court and the Deer Park nestle under Garway Hill surrounded by an Estate comprising of some 5,000 acres.The house has undergone various changes since the Scudamores arrived to live in the tower in 1058. Significant building took place in the 14C to be “modernised” by John Nash in 1795 and again in the 1820s by Thomas Tudor. In the heart of beautiful Herefordshire Kentchurch Court, this quintessentially English country house, provides the perfect setting for your wedding day. Come and have a perfect day in a perfect setting!